I was having a good day today. A productive day. I crossed most of my jobs off the schedule I write up every Sunday evening. I was on top of it all. And then all of a sudden from nowhere came a wave of something like sadness or worry or being unable to sit in my own skin. It was as if I was a character in one of the Roadrunner cartoons and I looked up and there was the big Acme anvil heading straight for me. Dark grey crush looming. For the first time in ages I wished I had some kind of pill, a tonic, a pick-me-up just to pull me out of the path of that anvil. But I didn’t and I don’t. So there was only one option. Get the heartbeat up. Puff it out all out. And at the park the water was almost midnight blue. Rippling like velvet sliced thin. And I saw two birds, cormorants, on the pier, snuggling. Leaning in to each other as if the other one was the only thing that mattered in the world. And for some reason those birds made me cry. There I was walking along the harbour shore, walking and crying, crying and walking. Like an eccentric character in a European film. I might as well have been wringing my hands. 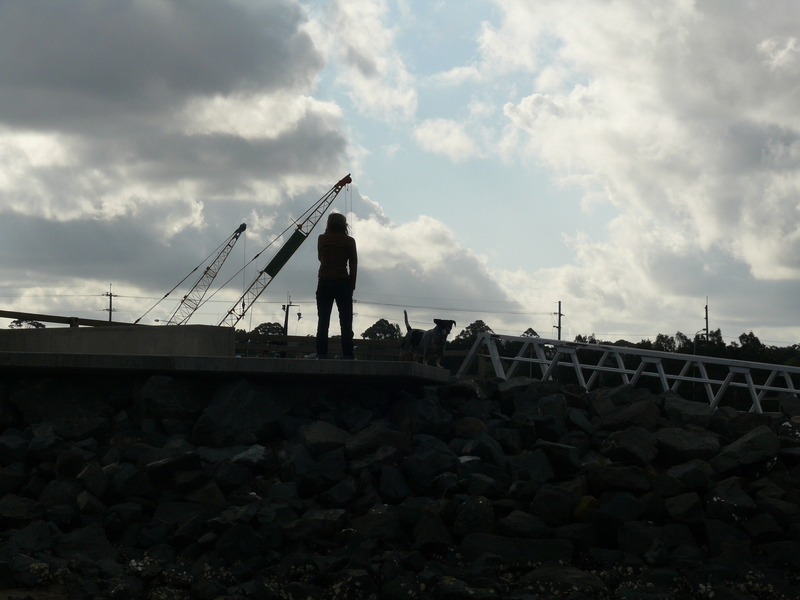 And then I saw this woman standing near the boat ramp looking up at the clouds as the sunset took over the sky. And it was as if she was commanding that sunset, slowly turning it on. She jumped down, dressed in running gear, all black like a commando and gave me a hug. A complete stranger. And I don’t know why she did it but I’m glad she did. And then she said : It’s going to be alright. Look at that sky. And then she ran off, her feet barely touching the ground. I couldn’t see them but it is entirely possible she had wings on her heels. Or maybe it was the power of the sunset sky because it did seem that she came from the clouds. She was definitely a spirit in the material world. From the sounds of it, She touched you twice; she got your attention with the cormorants and then sealed the deal with a hug herself. You are very fortunate, my dear friend. Gave me the chills. So vivid. The walk, the hug, the sunset: so much better than a pill. Wow. So thankful for this spirit, whoever or whatever she was. Wow! I love this story! I love that you did what your instinct told you to do (walk), and then the universe gave you what you needed. Maybe she was the messenger delivering all the hugs and positive thoughts we are all sending your way! Walking works for me, too. Great story! Walking for me too every time. Not always as exciting as this walk though! I’d say that was an angel. I’ve had a few show up at key times in my life…she gave you what you needed at that moment–a way to come out of yourself and realize that our own darkness is never unique. Great writing, as always! That’s amazing – you must have looked really down Selma – hope you are feeling better today. A similar thing happened to me one day at work – I was feeling really depressed and Laurie Laurence (who was in the building trying to get funding for his swimming program – saving kids from drowning) came up to me (he didn’t know me at all) and told me to cheer up and gave me a copy of his book. that was an angel selma, you were gifted, so it seems. it is so wonderful how sometimes these moments when we meet someone who responds in a miraculous sort of way, when we are not even asking, and that moment can lift us from weariness and give us strength. angel stuff. many more hugs to you! Oh Selma, I have often ‘run through the tears’ but I’ve never had a stranger comfort me that way! How wonderful. What a lovely story. I hope you’re feeling better now. It’s amazing what a good walk can accomplish, and to meet a complete stranger in that way gives us faith again in the kindness of others. Great story Sel. I have no doubt that spirit sprinter was there for you, at just the right time. I’m feeling rather down tonight, this really picked up my spirits too, thank you for sharing. It’s beautiful. It made me cry, but in a good way. The kind of crying you don’t mind doing. My mom is a random hugger. If she sees anyone looking sad or down she throws her arms around them and whispers a quick prayer for God to lighten their hearts and give them peace. I used to think she was eccentric. Now I think she’s beautiful! it only takes one person to change another, this lady sounds like sweet, an angel in disguise perhaps? Perhaps she was the inspiration for that Police song? Hugging you from afar, Selma. It was actually quite an amazing experience. Sometimes there is a kind of synchronicity out there, isn’t there? It’s magical. Much better than any of those, for sure. I feel so lucky to have encountered that woman. Whether angel or human, she was full of light. I am so thankful too. I do have a theory that some people have angelic qualities. They may not always be in evidence but they emerge when needed. That thought, whether it be true or not, really keeps me going! It’s true. Just when you think you are sort of going it alone the universe throws someone in your path. It is staggering when it happens but in a very good way. I am so thankful it happened! I think she must have been. That is the power of positive thinking and prayer right there! Oh yes. Walking really is fantastic. It has never not worked for me. It just alters yours perspective, doesn’t it? Great to hear from you! It was the last thing I expected to happen. But a very welcome thing. That’s the thing with walks – you just don’t know what experiences you’ll have on them! I really like your point about our own darkness not being unique because I do believe that even the dark has a commonality and when we can see that even in the darkness we feel less alone. What a fabulous comment. Thank you. WOW. You met Laurie Laurence. Awesome. I think it is cute he gave you a copy of his book. He comes well prepared, doesn’t he? Hahaha. It is the not asking that is the gift, isn’t it? Some people have such generosity of spirit. I do believe there are angels everywhere. It keeps me going. I do feel better. Truthfully, I wasn’t really feeling too bad – what really happened was just a sudden plummet in mood that seemed to come from nowhere. It threw me a bit because I just went down. Thank goodness for walking and angels! I couldn’t agree more. Kindness has such power. It is so restorative. And when we see it is does reignite our faith! I am glad this pepped you up a bit. Sharing stories often helps me too. I hope that you encounter a spirit sprinter of your own. It was quite amazing! Awwww. I know what you mean. It’s the kind of crying that is full of gratitude and joy because you realise in some kind of metaphysical way that we are not alone. And that is such a comfort. Your Mum is a truly beautiful lady. I love that she does that. Can you imagine how many people she has cheered up with her hugs? She is an angel too! Thanks for checking in again. Yes, it has been quite a week with Cyclone Yasi and all. I haven’t been physically affected but mentally it has been hard to see all the devastation. I feel so badly for all the people who have lost everything. And for all the wildlife killed. So sad. I think she was an angel in disguise. And I love your point about it only taking one person to change everything. That is so true! It is entirely possible. If I were a songwriter I would have written a song about her for sure. Quite an awesome experience! It was. I could almost hear the soundtrack in the background.It was quite atmospheric. Haha. The mystery hugger was as aware of your need as you were of Rory’s dog! Perhaps as GB said, you express you feelings as well on your face as you sxpress them in stories. If that’s the case, no mystery, just snother compassionate human being! Loved all the stories since my last visit. Cheers mate! Walking the cloud away, crying at the birds, I know that feeling. I think we’re all capable of being angels in the right moment, a wonderfully uplifting story, beautifully written and a tonic to read. It has been said that I have an open face. I think sometims it is overly expressive. That’s why I never win at poker. Haha. Cheers to you to. You are also a very compassionate person. It is awesome! Can you send her my way, the next time you see her? I could use some cheering up. Oh, I’m sorry you’re feeling a bit down. I hope you have a magical encounter to lift your spirits. Look after yourself.